Sikratho: Greetings! My name is Sikratho and I am a vegetarian dragon. 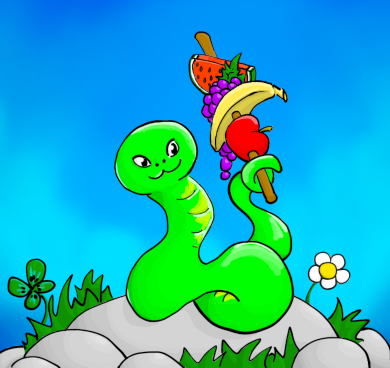 Could you please help me collect the best fruits in this garden? Yes! I will help you honorable dragon! How can you possibly be a dragon if you have no wings, no arms and no legs? Sikratho: Wings, arms and legs do not define a dragon and I identify myself as a dragon. Will you help me? Yes! My talents are at your disposal mighty dragon! Are you, at least, capable of blowing fire? Sikratho: This would be most irresponsible given the risk of fires. Will you help me? Yes, I will help you Sikratho, the fiercest among all dragons! What do you need the fruits for? Sikratho: To maintain my status as the most epic of all dragons, I need my vitamins. Can I count on you? Your wish is my command, oh dragon! Sikratho: Oh dear! I am so hungry! I really needed a helping hand, for I have no hands! Thanks to you Dragon Sikratho can prepare an excellent fruit skewer! Be careful! Your energy level is low. Even the most powerful wizards have limits. If you take too much strain over your body and mind you might fall sick. Are you sure you want to cast this spell?